Now that all the skin areas are completed, time to put my attention elsewhere. I thought I would dye up some suitable background colour….boy…did I goof. 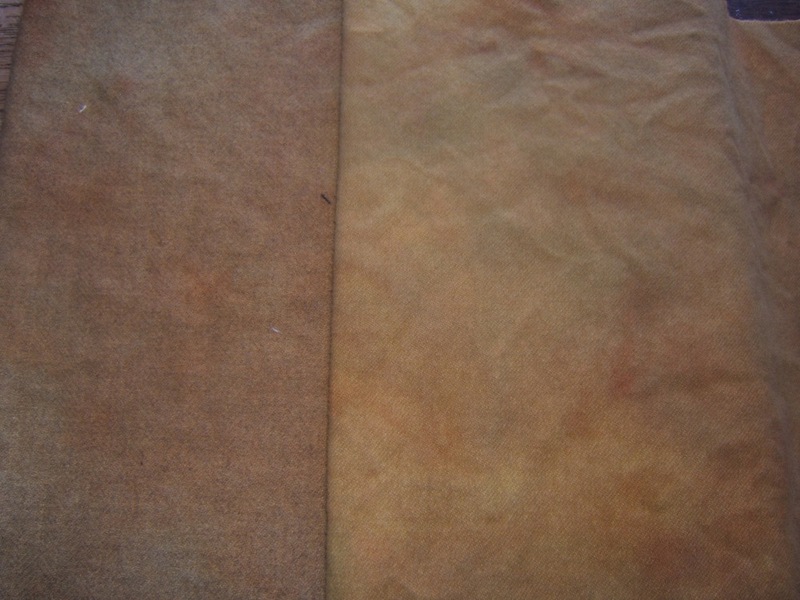 For some reason I had in my mind that the background was a yellowy brown..
..so I dyed over 1/4 yard natural and 1/4 yard oatmeal, using mostly ‘maple sugar’ with a touch of ‘mustard’ . I liked the colours, but when I looked more closely at the photo of the painting….that isn’t the background colour at all….only in the small section at the top left. but the concensus at my Sunshine meeting this Tuesday morning, was that it was fine….so I’ll leave it…at least for now. 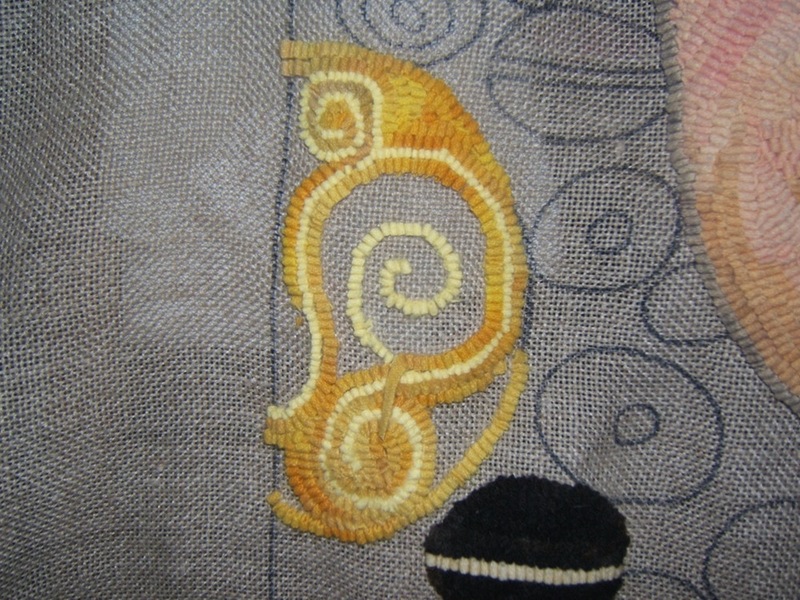 I’m using the same pale yellow in a 4 cut for the swirls in this motiif. This seems to be a slow process, matching and blending the yellows. 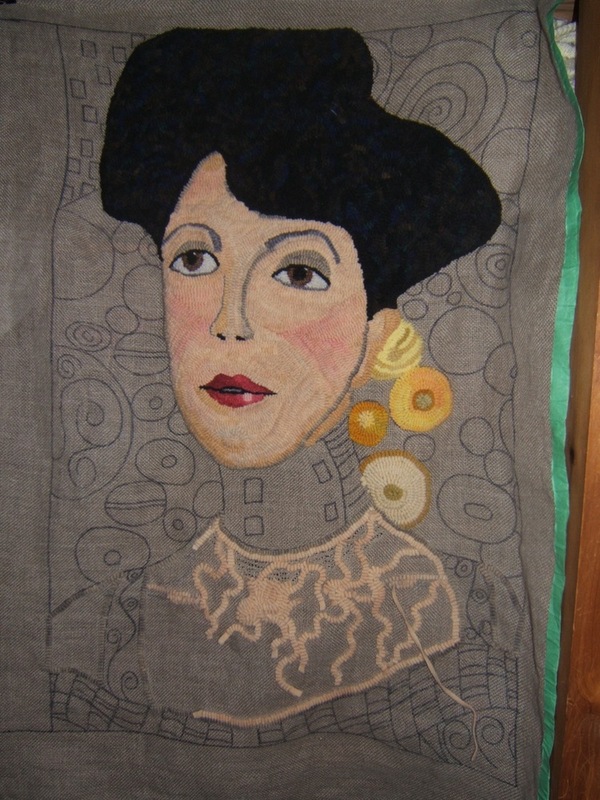 I worked on it all last evening, and only got this far. I’m still mulling around a variety of ideas about how I’m going to treat the background. Just an aside….I was browsing through an old “Rughooker News and Views” (1985) magazine this morning and noticed an add for Bliss and Frazer 500 strippers….$63.00….and cutter heads….$9.00 each….wow! I always knew I was tight for wool for the chest and I thought I’d likely have to dye more. 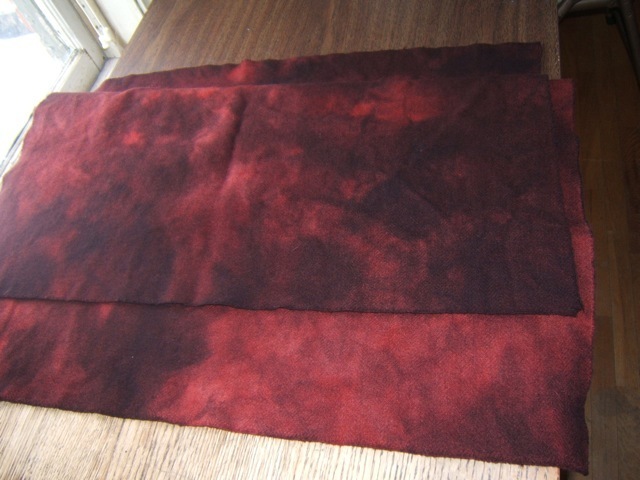 But as I got closer and closer to the end, it started to bug me that I would have to dye such a small amount. 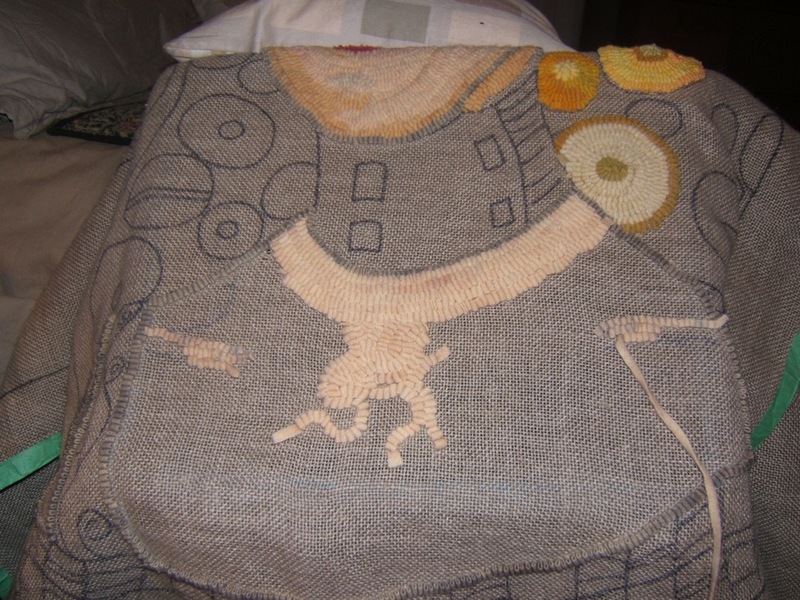 Then it became a game to see if I could possibly finish just using the wool I had. 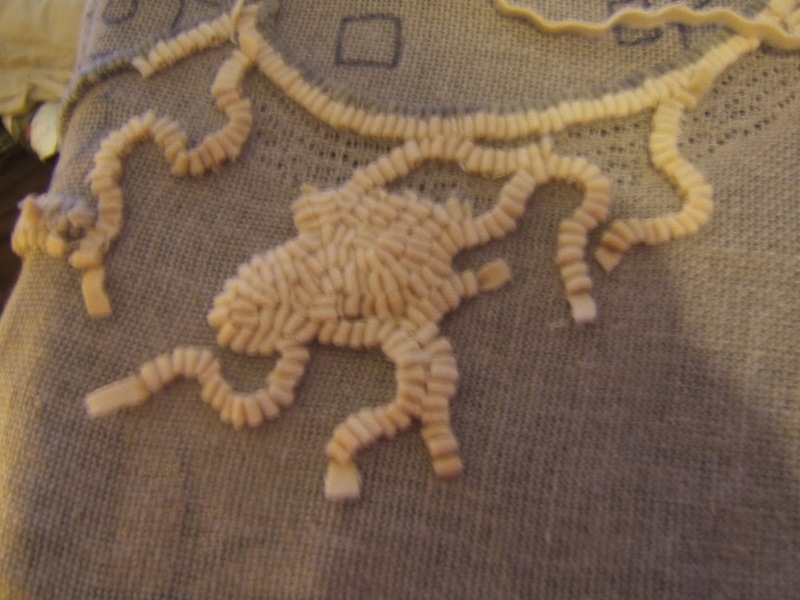 I fished out worms left over from the face to fill in the crevices between the wiggles, I used all the left over small strips…..and I did it……just! This is what I have left. A few days ago I started to dabble with the background circles and ovals, using the painting to try to replicate each one. I began by getting out all the various yellows in my stash…and even went so far as to go through all my bags of worms….removing all the yellows. Yellow isn’t a colour that I am normally drawn to….probably because I can’t wear it very well…but I was surprised at the variety I was able to come up with. 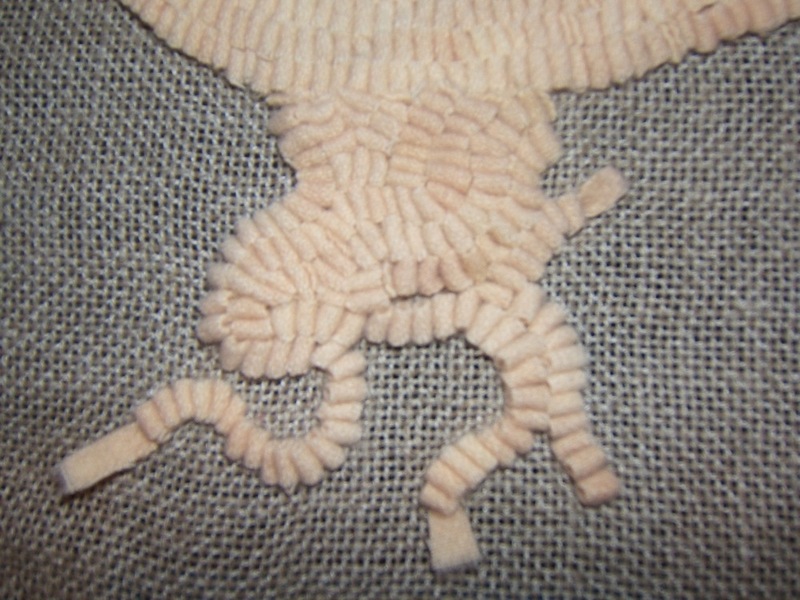 I hooked three different ovals…beginning with a cat’s paw in the centre of each. The painting appears to have all sorts of secondary colours around the ovals, but when I used the same sort of contrast…the whole thing was UGLY!! I ripped them out and tried again making everything more muted and blended and while each is quite different than the original, the overall impression is much closer. What did I learn today?…..replicating the details doesn’t necessarily work….while capturing the mood does. Even rows or a curly chest? I have never hooked a human chest before, so this is truly trial and error. 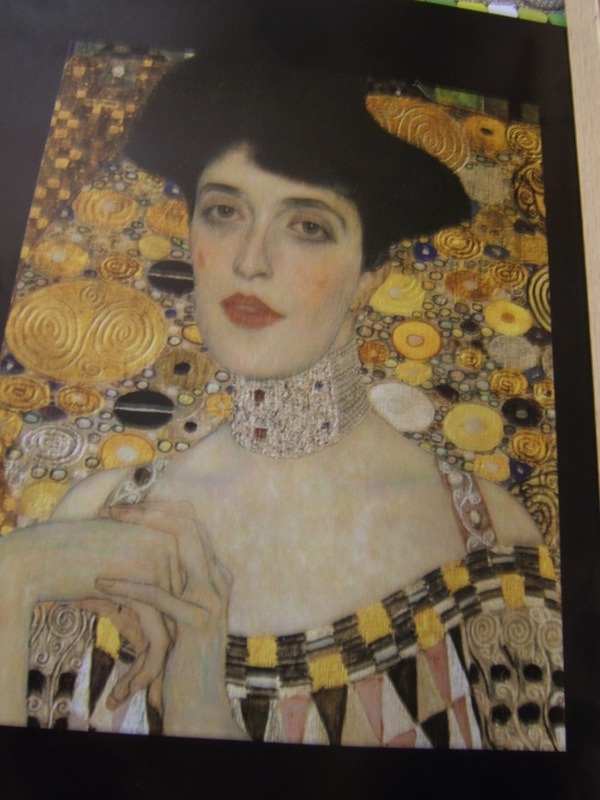 In studying the photo of the painting, the only visible highlights I could find were the collar bones, which were slightly grey. 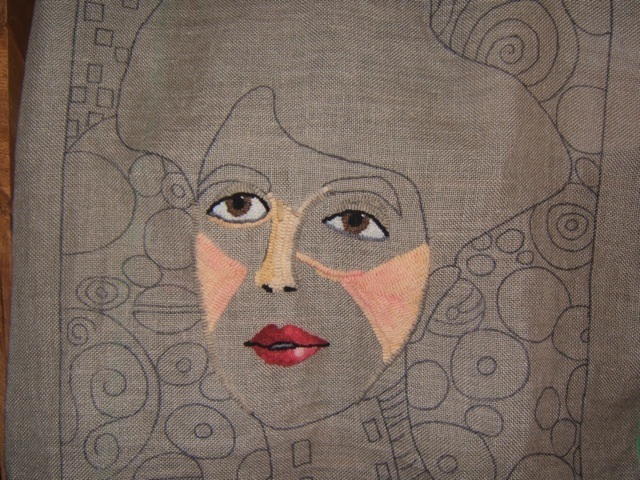 My shadow colour was too dark, so I found enough pieces of the paler blotchy grey left from before I overdyed the piece. The face is done in a 6 cut, but I saw no reason not to switch to an 8 for the chest area. 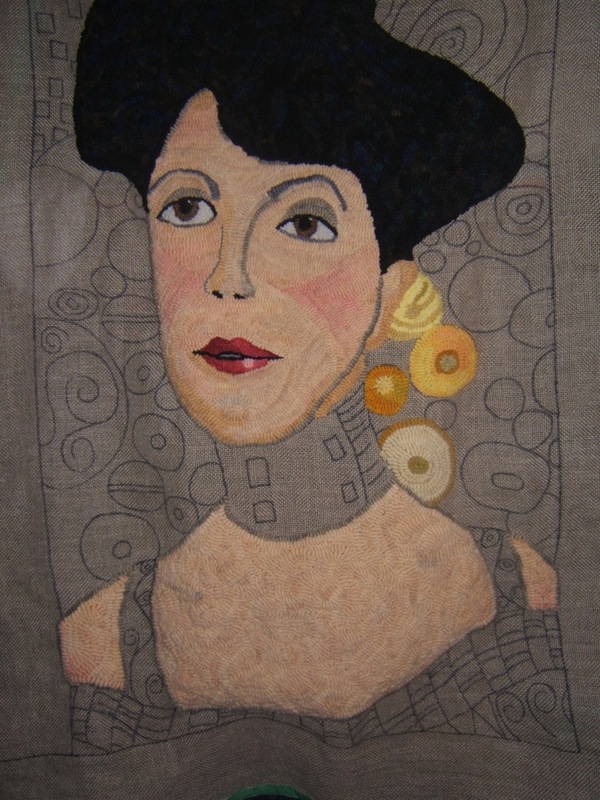 I did 4 or 5 rows working my way down from the choker, when it suddenly occurred to me, that unlike the face, where lines and contours are important, the chest area is essentially flat….so…..perhaps it would be more effective to do it in a curly pattern…like the hair. 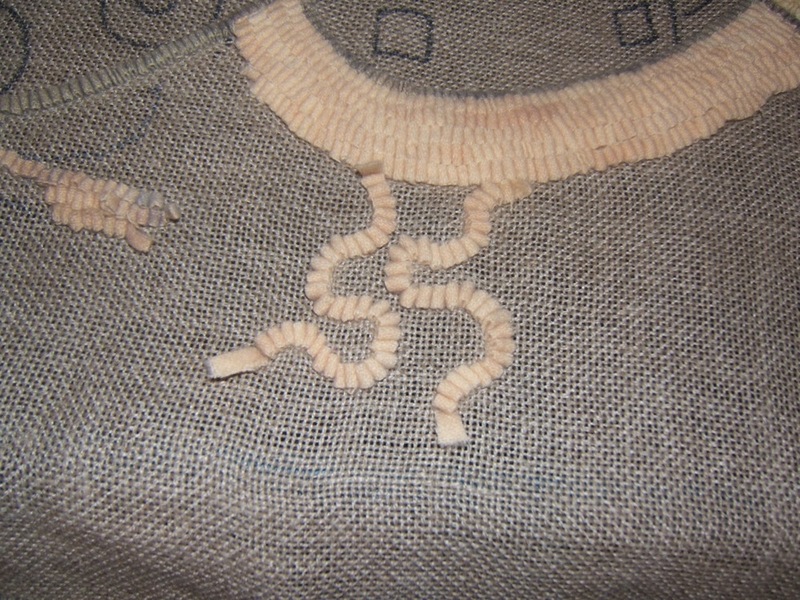 I decided that the only way to choose the best style of hooking, was to compare the two….. so… I did a small section in a wavy/curly pattern, under the straight rows. out with all the rows except the first…and forward with a different approach. This will definitely make it easier if I have to dye more flesh coloured wool…since the new wool can be added higgeldy-piggledy and any difference won’t be noticed! Whew ! Solved two problems at once. I got out a variety of black plaids etc. and soon discovered that although many might be predominantly black, they weren’t the same intensity. In spite of the look in the picture…these three had the same intensity. 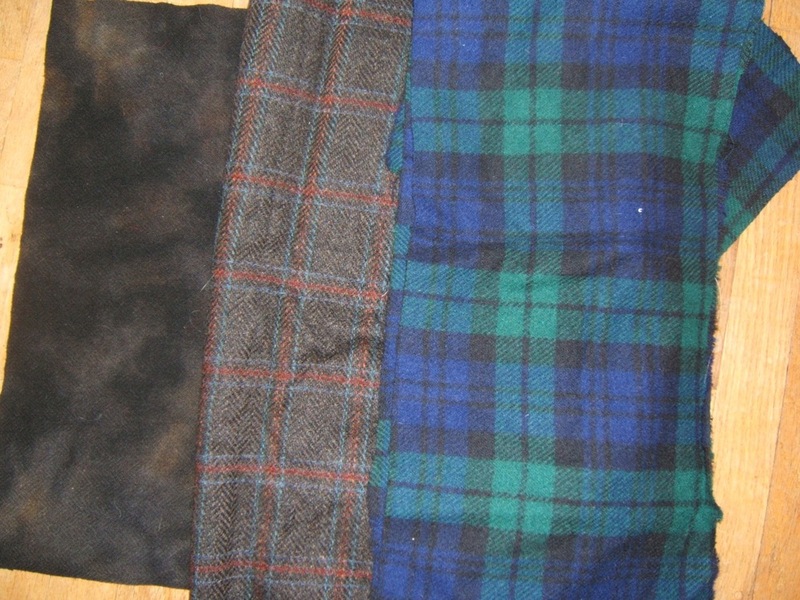 This was a very good lesson on ‘colour value’ for me, because what eventually worked best wasn’t black at all, but two wools which were of a like dark value….a brown/ black plaid, and a black watch plaid…which has no black in it at all, but is actually blue and green. 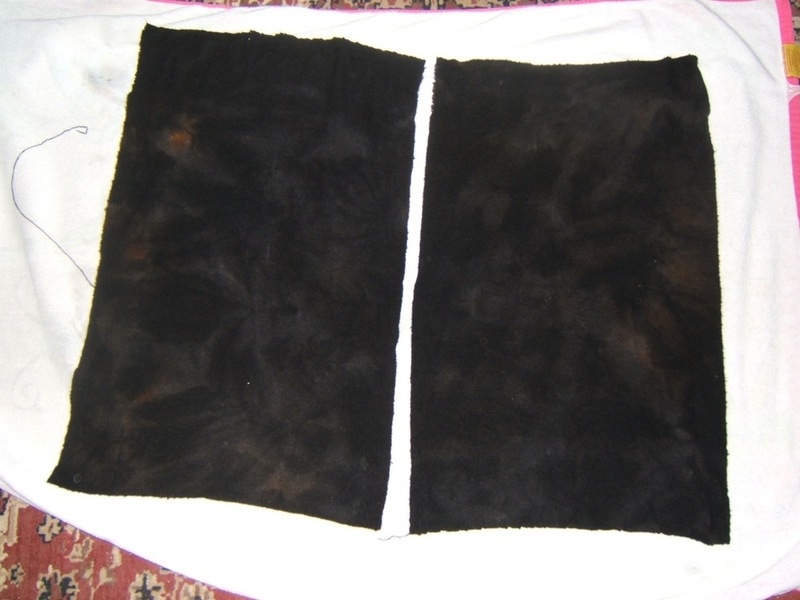 So there are actually four colours….the black I dyed, the maple sugar tones in that wool, plus the brown plaid and the black watch. Although I’ve had many tips and instructions on ‘value’..perhaps there is no better teacher than my own ‘trial and error’. 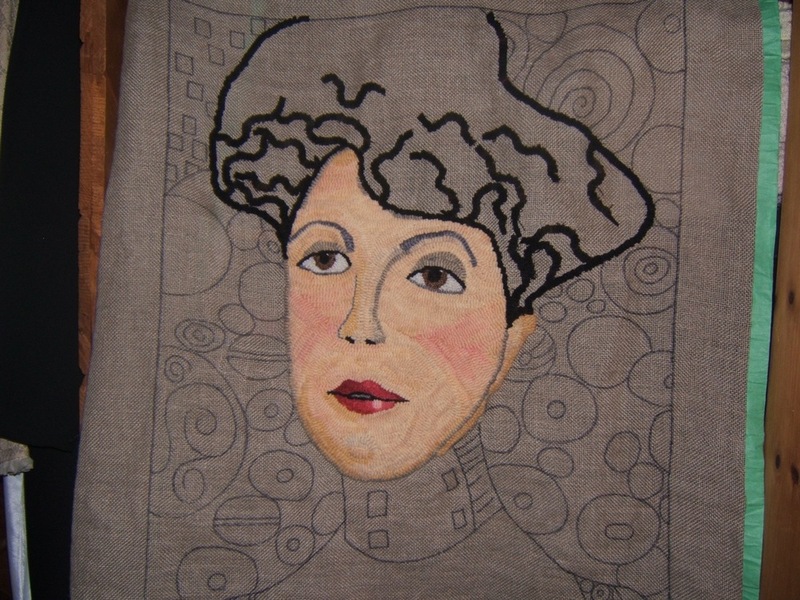 I’ll just let you watch the progression of Adele’s hair ‘growing’. Where do I go next?? I think back to my dye pot. I’ve studied various photos of Adele’s hair, and as far as I can see, it is just…..BLACK. 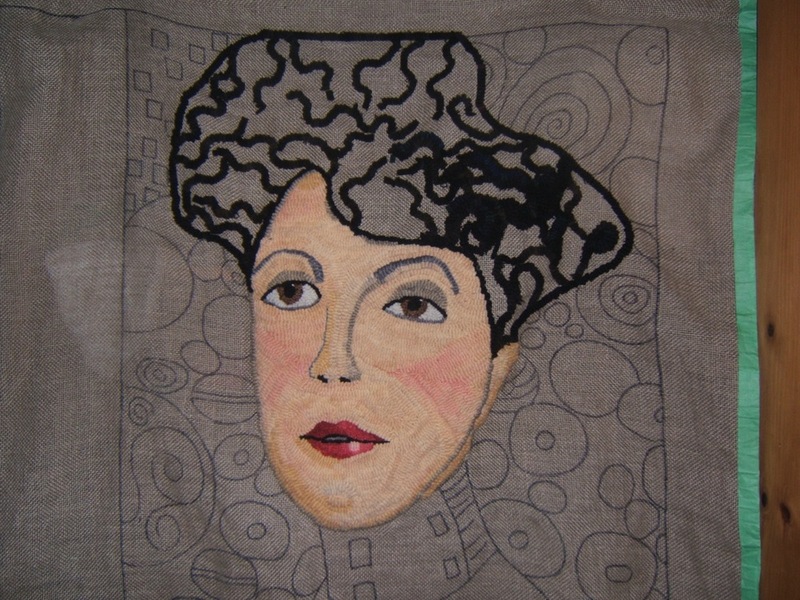 However, the hair, is a large portion of my piece, and I’m going to do it in a variety of ‘blacks’ to give it some life. 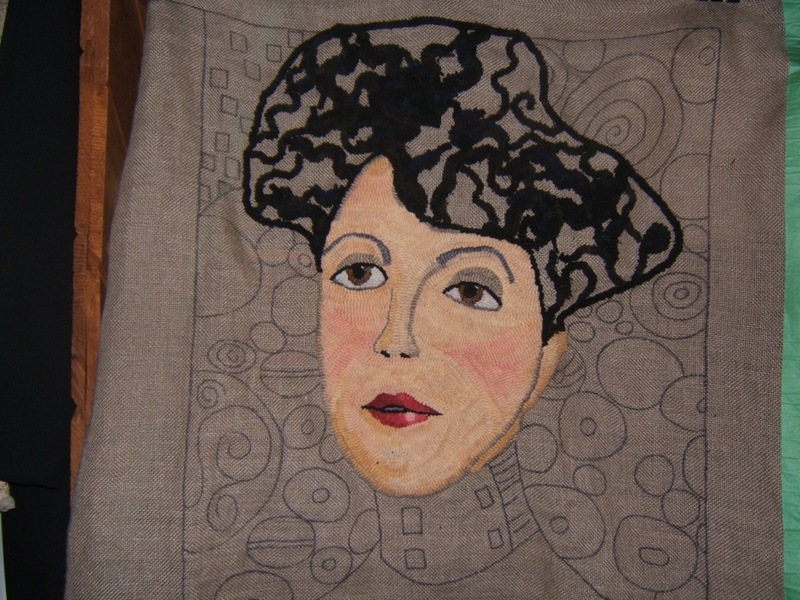 My intention is, at this point…..(early Monday morning) ….to dye up an antique black, using the oatmeal as a base (I don’t have enough of the wool for my hall runner background to risk using that). 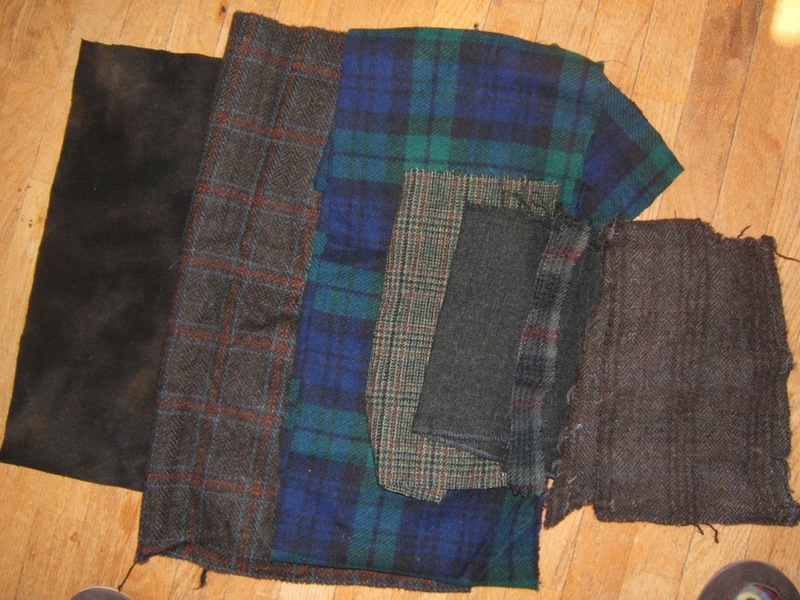 I have a variety of black plaids and tweeds in bits and pieces which I hope will work for extra highlights. I’m not sure yet whether I will marry those colours, or use them as is. So those are my intentions as of 7:30 am…..but it’s a woman’s prerogative to change her mind! 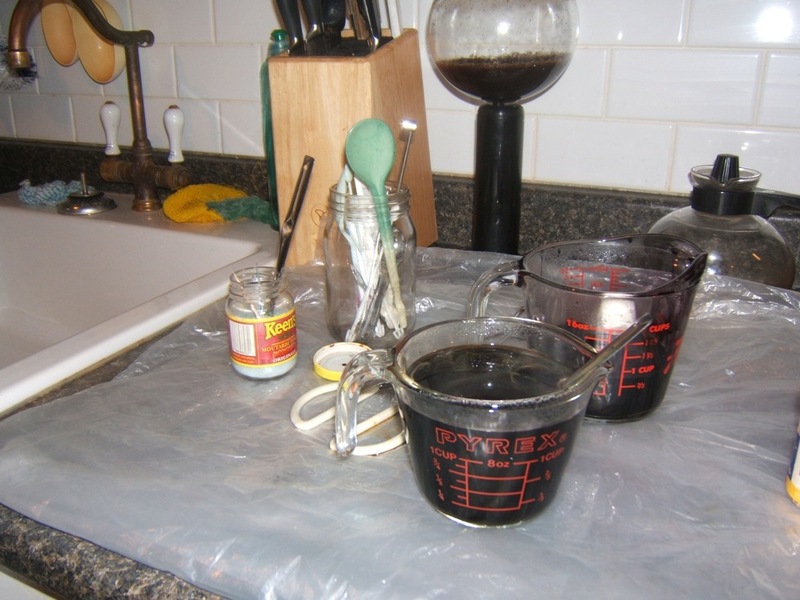 1:00pm…..I used my basic antique black recipe as a guide, but instead of using ‘bottle green’, I used ‘maple sugar’ (not the real stuff…the pro chem dye). 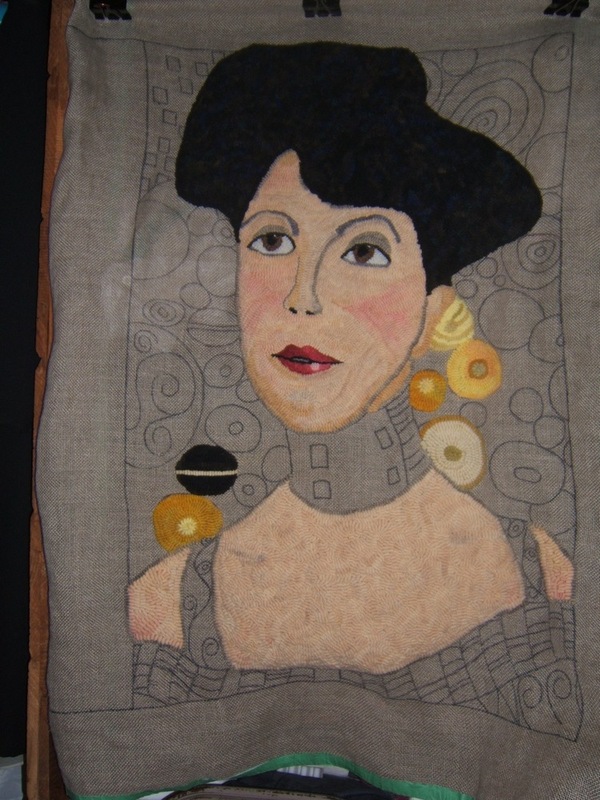 I made that change for a couple of reasons….the most mundane being…I don’t want to run out of ‘bottle green’ before I complete the background of the hall rug, and secondly, I plan to use the ‘maple sugar as a background colour, and thought it would tie the two areas together, thirdly it seemed like a good highlight for black hair. Then, using my tongs, I made sure everything was soaked through. I covered it with tin foil and put it in the oven at 300 degrees. 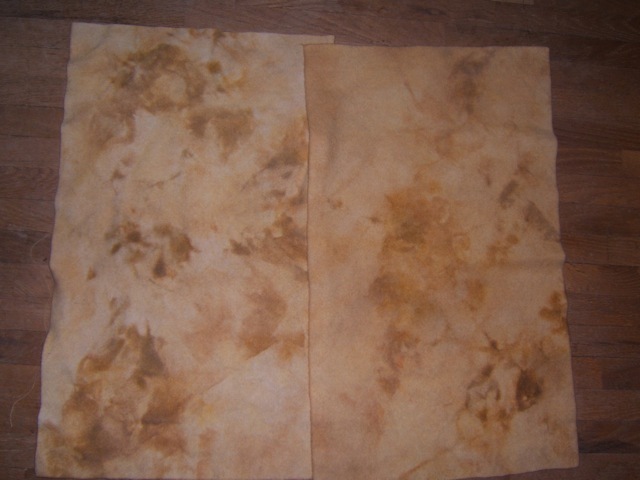 After 1 hour the water was clear, so I took it out and rinsed it. 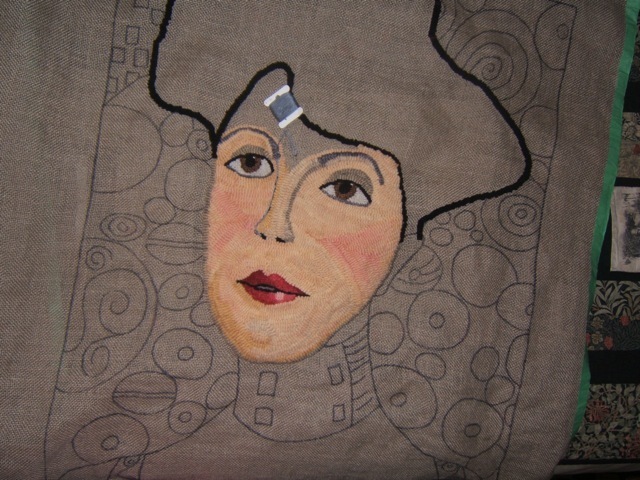 I did the eyes and mouth in 3 and 4 cuts, the flesh in a 6 cut, and I’m trying an 8 cut for the hair. It will not only be faster, but more realistic I think. My morning smile….my spell check doesn’t think ‘tweaking’ is a word! Not too many rughooking lexicographers about I guess! 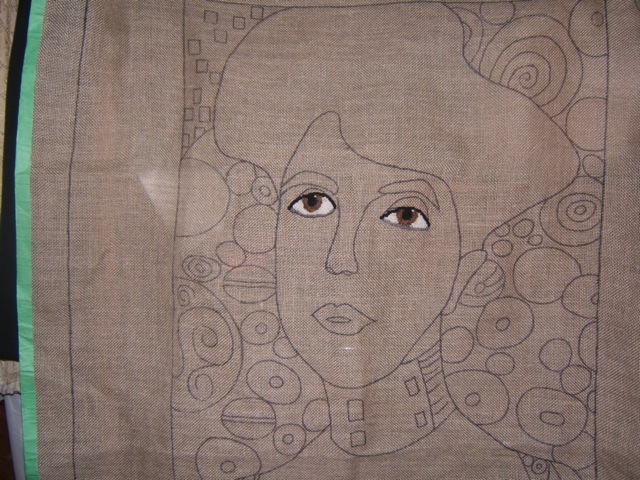 My process for tweeking Adele’s face goes something like this….After I’m done hooking a portion or want a break…..I clamp the piece up in the room so I can easily see it while reading or watching TV. Then I periodically stare at it…what do I like…what disturbs me? …and if something disturbs me,,,why…and how can I change it? 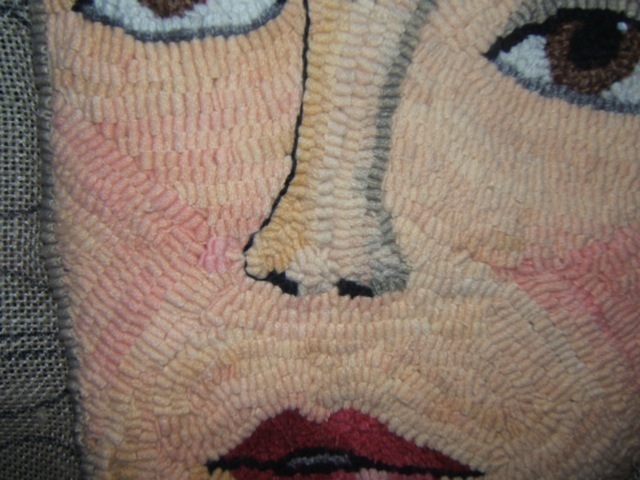 Adele’s nose has gone through several adjustments in this process. First I changed the order of shading to have the highlight in the centre. 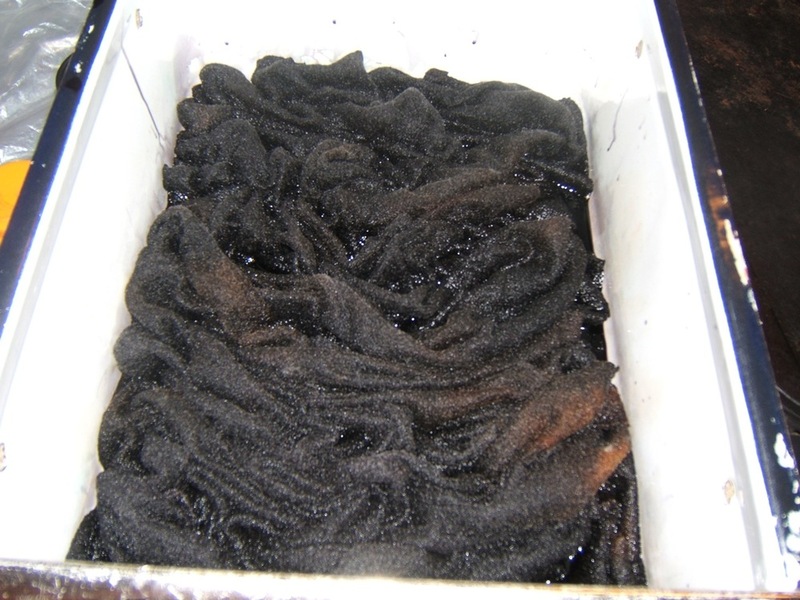 The wool I thought would be the lightest…didn’t turn out that way. (still not too sure I have this right). 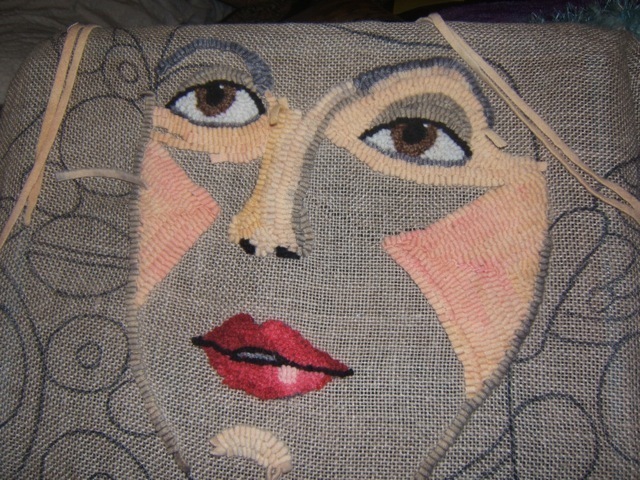 Then the flare of the left nostril was too small so I extended that a bit. 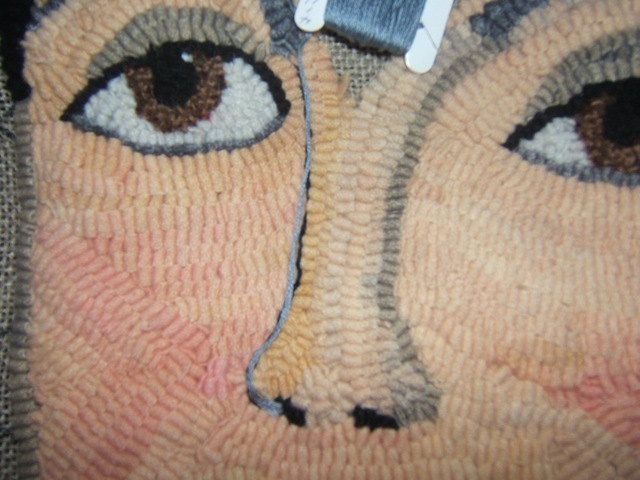 Then the left side of the nose didn’t show up well enough against the face…so I outlined it with black embroidery floss. The left side of the nostril now seemed a little larger than the right side…..so I flared the right side out a bit more. Another area that concerned me was the jaw line. 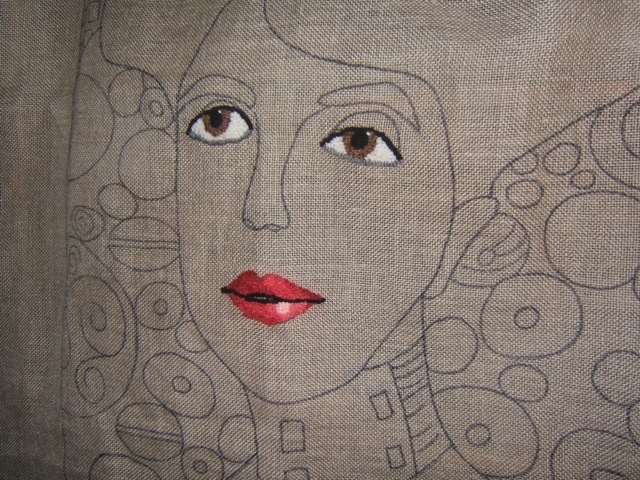 As I filled in the chin and cheek areas, it seemed too broad. 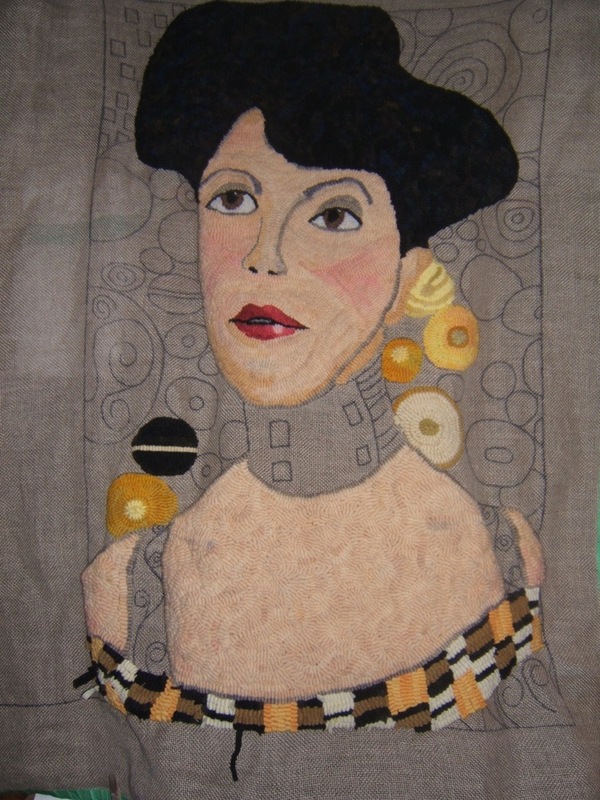 I pulled out the outline row, and the shadow row, and moved each back one row, and I think the profile now more closely resembles the Glimt painting, I outlined the hair so that I would have a better perspective on how the head would look as a whole. 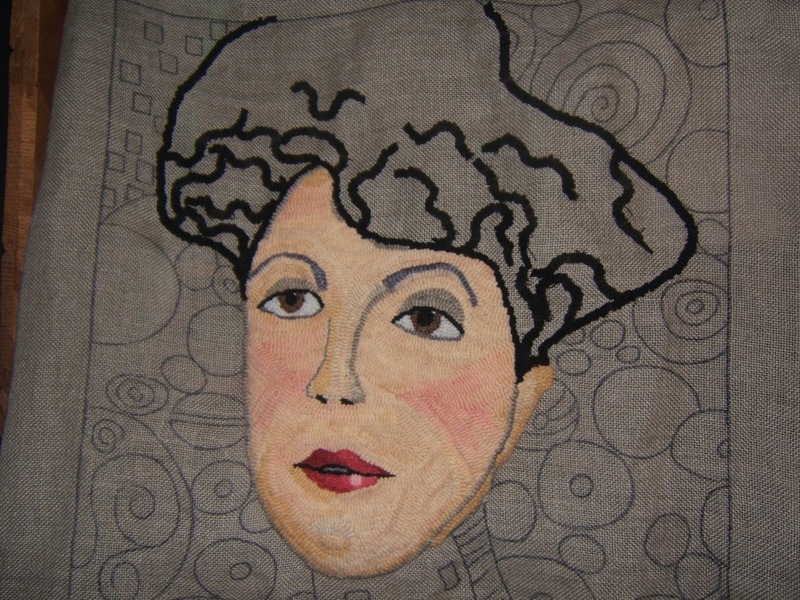 I then decided that the black embroidery floss was too stark, and I didn’t like the line running all the way up to her eyebrow. 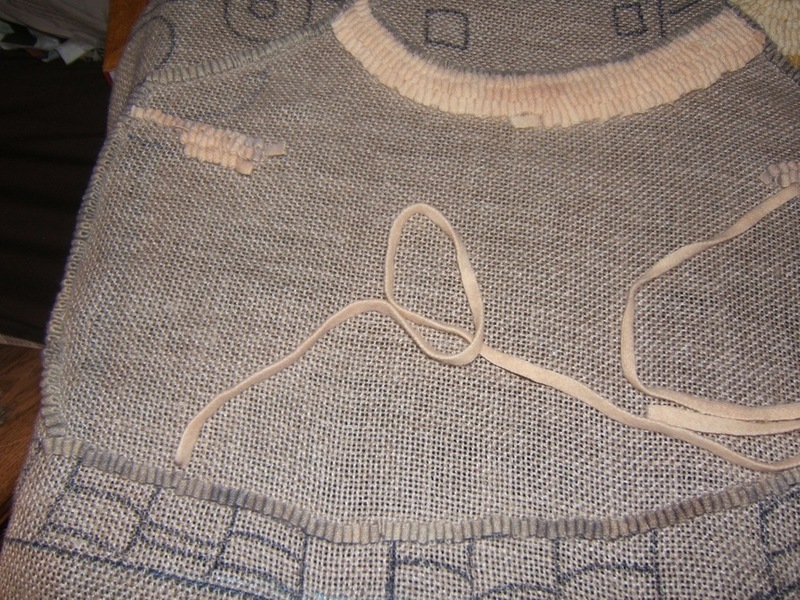 I placed grey floss over top to see what it looked like….liked it….ripped out the black and redid it with the grey. All of this may sound like a lot of work….but actually. 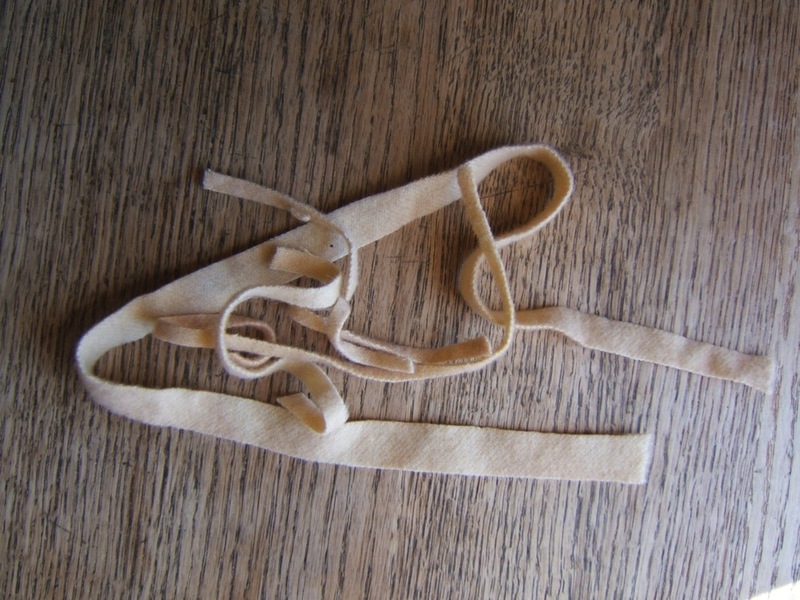 I just pull out a few loops replacing what is necessary, and it only takes a couple of minutes. The time consuming part is the looking/analyzing time. 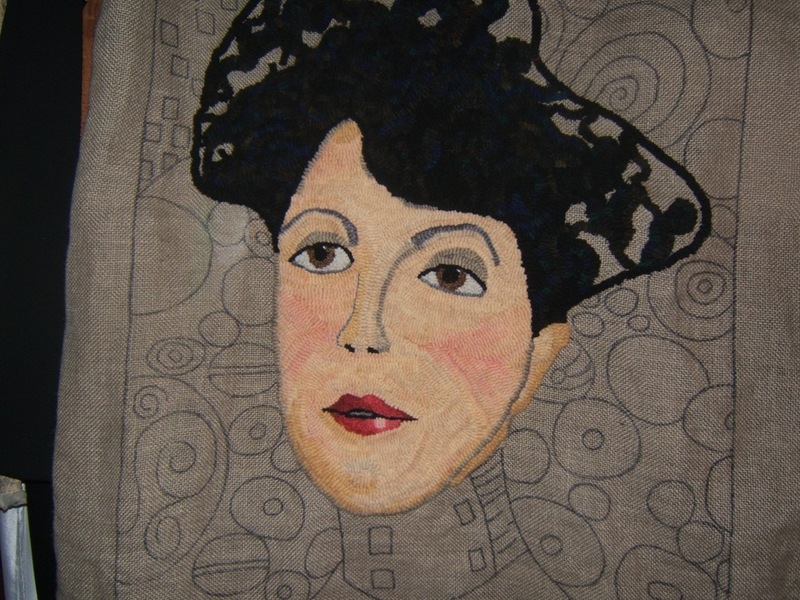 This process happened step by step over several days as I worked on the rest of the face. 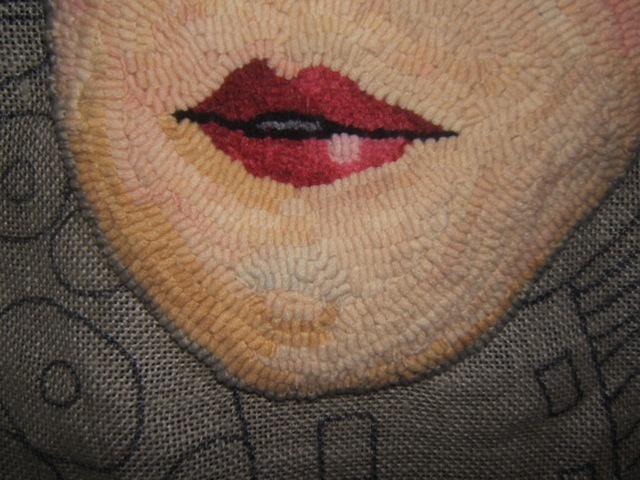 The whole face pleases me much more now….and when all is said and done…..that’s all that really matters! 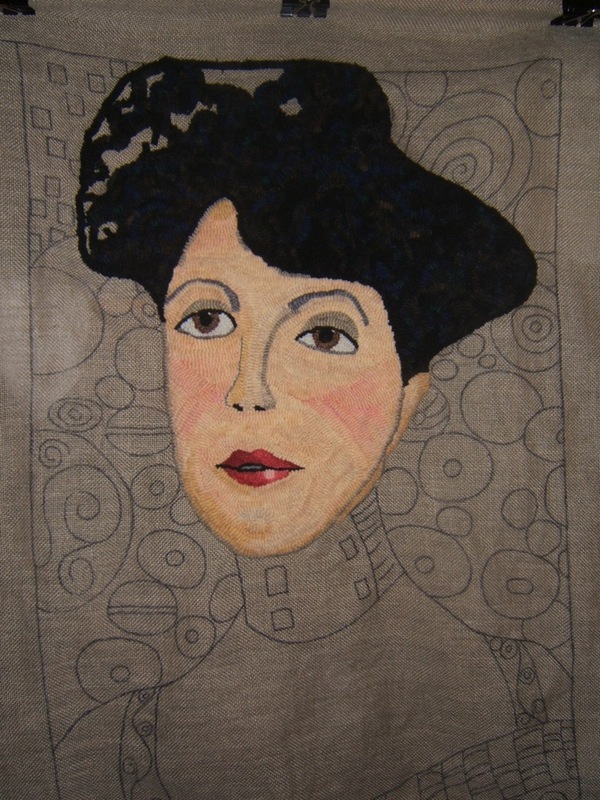 The Hygieia piece will need a lot of outlining, and this is the result of a quest for something appropriate. 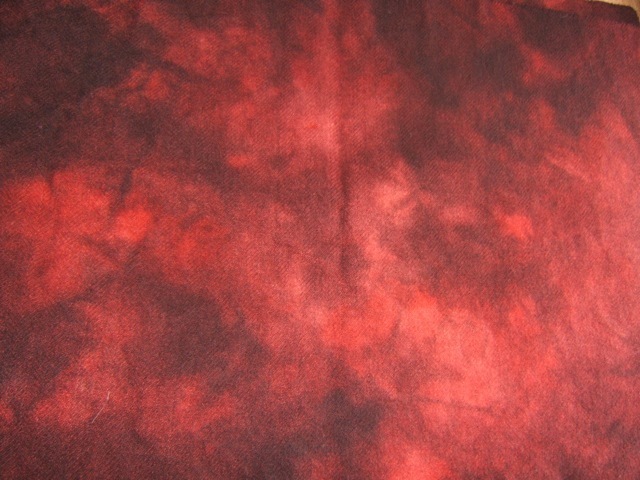 I dyed 1/2 yard oatmeal with 3/4 tsp mahogany. I’m not sure if I’ll use it for outlining, but it is a beautiful colour nonetheless. A very short post this morning. My sister’s husband passed away last night. They live just a few blocks away, and we were best friends as couples as well as relatives. It is a sad day. I spent Saturday afternoon and evening hooking and watching the Canadian championship curling (YEA!!! Glen Howard won both games and was in the final Sunday night..(when he lost to Manitoba).Glen is the skip of the Ontario rink and plays out of Coldwater…a little town just 15 miles up the road. 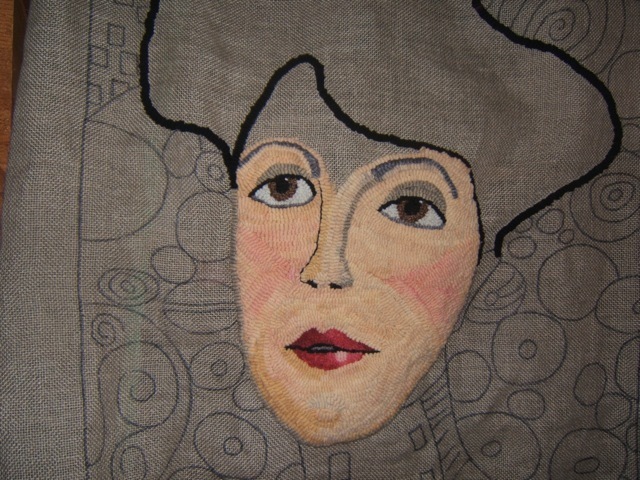 I completed both cheeks (the blush part) and tweeked the nose several times (I’m sure it will get more) but I’m not happy with the outcome. My colours are still bothering me. I finally came to this conclusion. My experience and information comes from a face in which using multiple colours is an essential part of the concept..I’m trying to translate that to a face which is essentially monochromatic….”ain’t workin”. 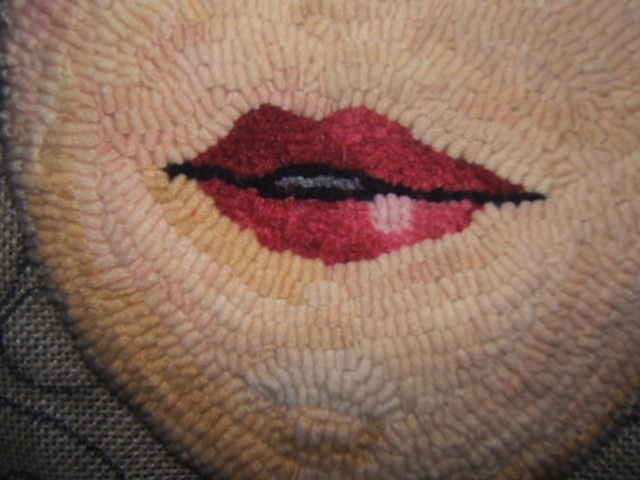 SOOOOO… I went to my catalogue of Rug Hooking magazines, and spent an hour searching for articles on faces. (I’m fortunate enough to be housing June Baker’s RHM copies) Wouldn’t you know it…the first two I found…I didn’t have that copy of the magazine. 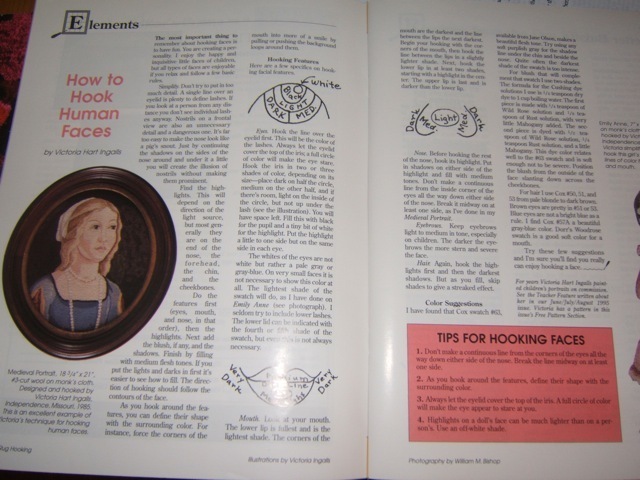 But eventually I found an article by Victoria Hart Ingalls in the Jan/Feb 1996 copy. 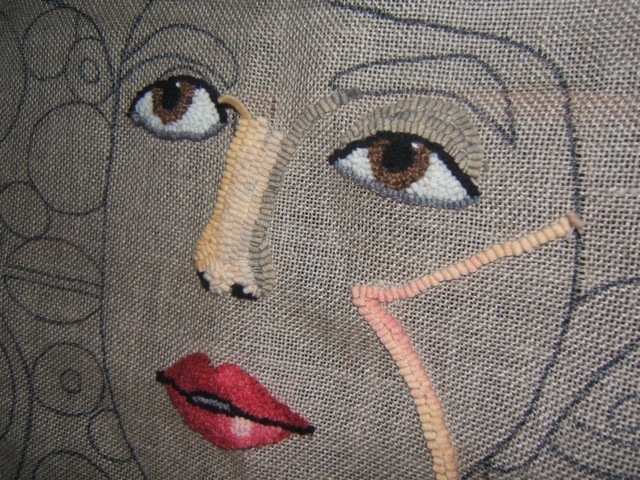 It’s entitled ‘How to Hook Human Faces’. Much of the information corroborates the information I have, there is really helpful new info on highlights, and essentially…i think I have to go back to the dye pot yet again (is this 3 or 4 times?) and come up with much more closely related swatches. 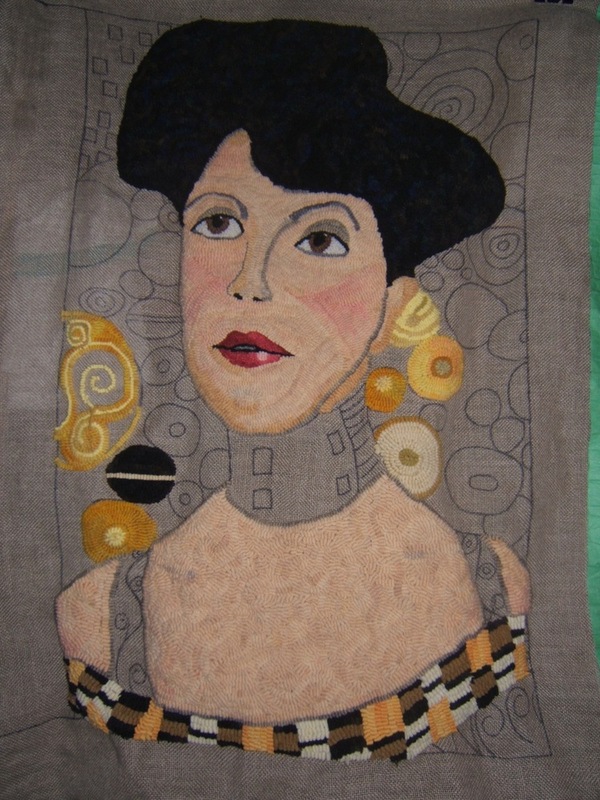 (I’ll have yards of oops-wool available to overdye for the background)….actually I think I’ve come full circle…I started this way and wasn’t pleased with the lack of contrast…Oh MY!! Perhaps the most helpful bit of information gleaned from the Ingalls article has to do with the eyebrows. I drew them based on how big they were in the painting. The article cautioned that they must be kept small, or will produce a scowling face. I hooked them therefore about 1/2 the original size, and she still looked very angry, so I reduced each one to only one line of hooking. 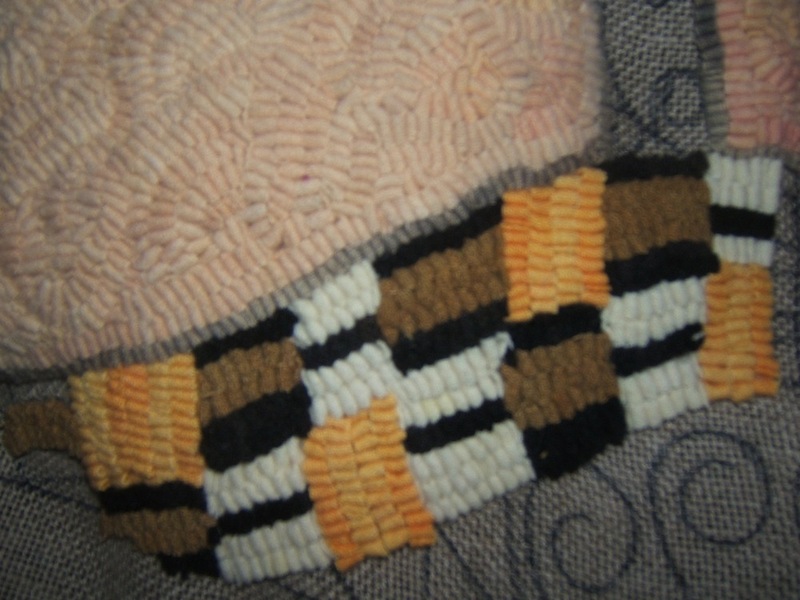 Well my brilliant idea for dyeing the face colours didn’t work…there isn’t enough contrast so that when the wool is cut into strips (i’m using a 6 for the face) you can’t see the contours of the nose at at all. I figured I needed more contrast, and to that end, I re-dyed the spotted grey with more grey all over. That seems to be working, as an outline and shadow definition. 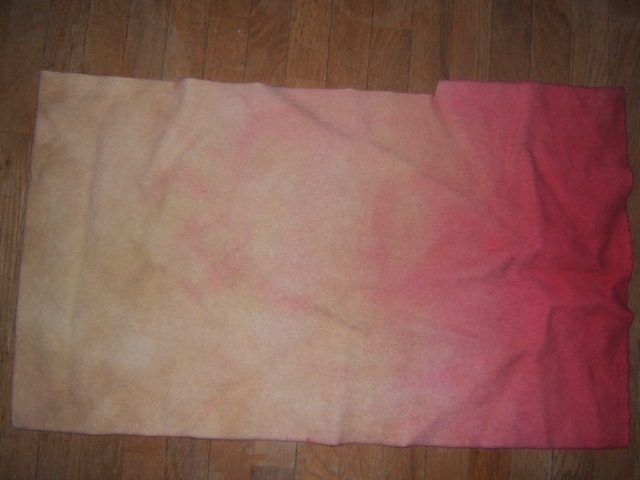 I dip dyed one piece in 1/128 red to get the cheek blush….it was too red so I overdyed that with sand pink, and like that result…although the one end is far too deep to be used). 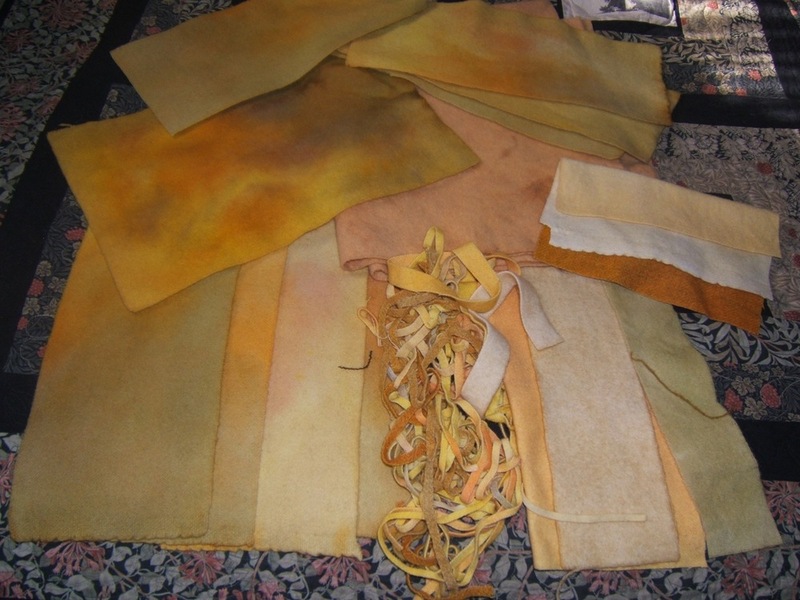 The other pieces, I overdyed, with the same flesh recipe…I thought, but they turned out WAY too yellow, so now it’s back to square one to try again for a basic flesh colour (with a definite yellowish cast and some gradation ). I’ll get it right yet Adele….just be patient! The first thing I had to do before I could begin, was put a #4 head in the Frazer cutter. I hadn’t used it in a long time, and now I know why I love my Bliss! 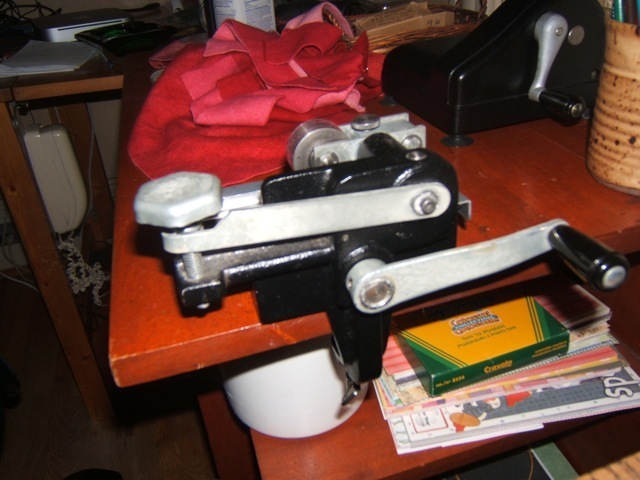 I never would have been able to do it without Ray’s help!….what a pain in the neck!…I definitely needed 4 hands. I must admit it cuts smoothly now that I finally have the head on and the tension sorted out! 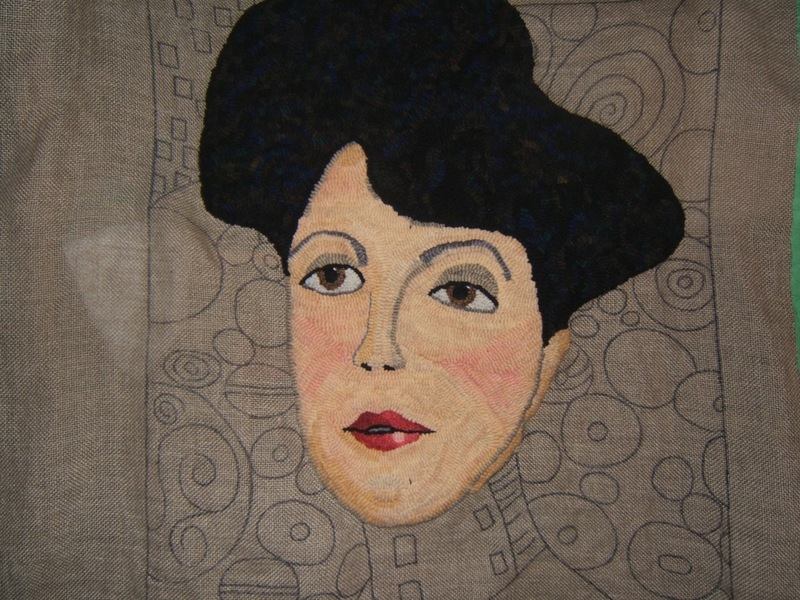 I started by outlining the oval of the eyes – the top dark – the bottom medium grey. 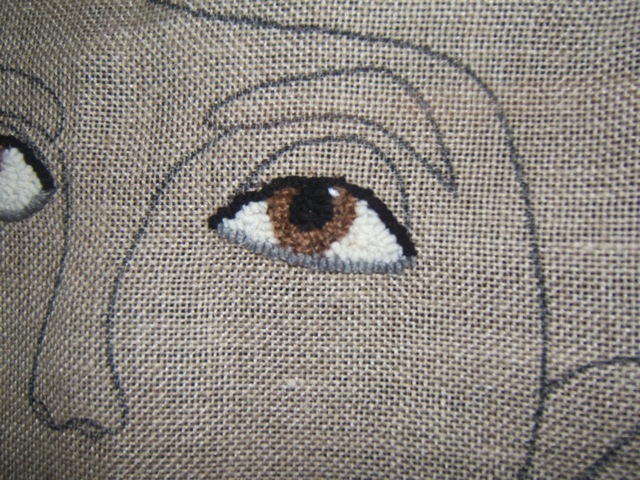 Adele appears to have rather hazel eyes, so I found a piece of light brown plaid that had bits of green and used that for the iris. 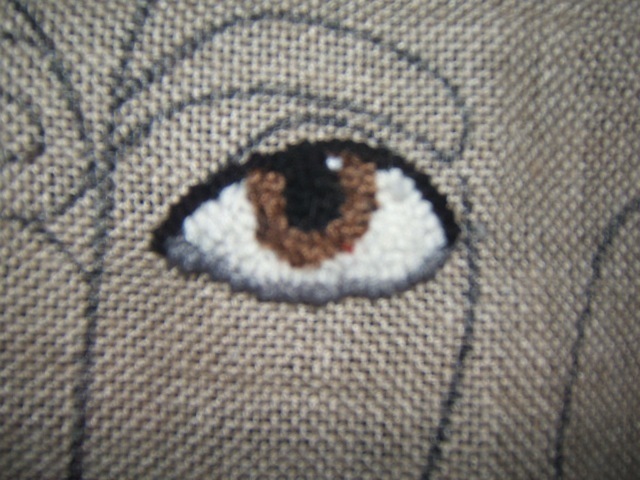 I used two strands of white embroidery cotton for the highlight points, and a muddy white for the ‘whites’ of the eyes. It bugs me that there is white under one iris and not the other…I may have to change that. After looking at it over a couple of days, I think I will take out the whole left eye, and lower the top line a bit….thus making the lid a bit larger, and the eyes more balanced. I dug into my tub of red’s and came up with a wide variety from pale to deep. 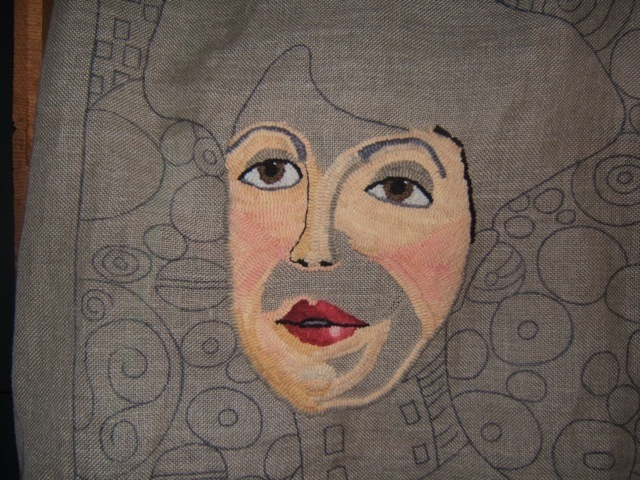 I started by outlining between the lips then added the pale lip highlight, then used various colours, but didn’t like the result…..the reds were too different. I took that out and found the left overs of a red 6 value swatch. The top lip was to be darker than the bottom, so I basically used 0 to 2 on the bottom, and 3 to 5 on the top (with some mixing of that plan). 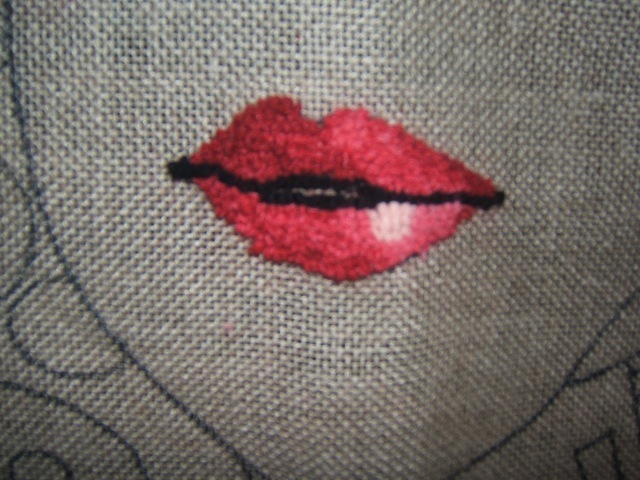 I may do some tweeking of the lips, ( borrowing Gene’s word) but over all I’m satisfied. 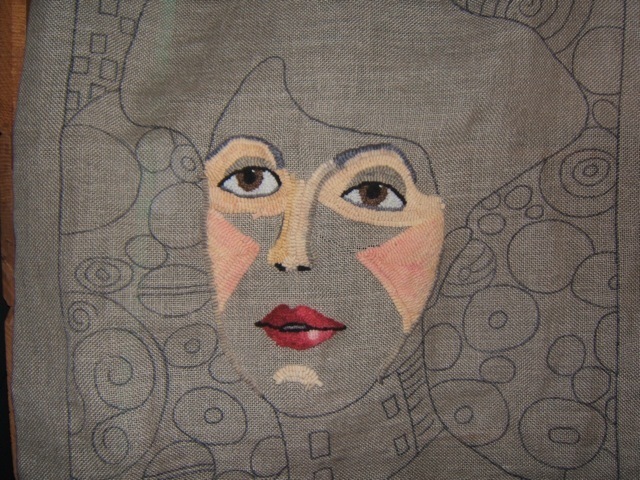 Next begins the nose, but I don’t have enough variety available in skin tones, so I headed to the dye pot. 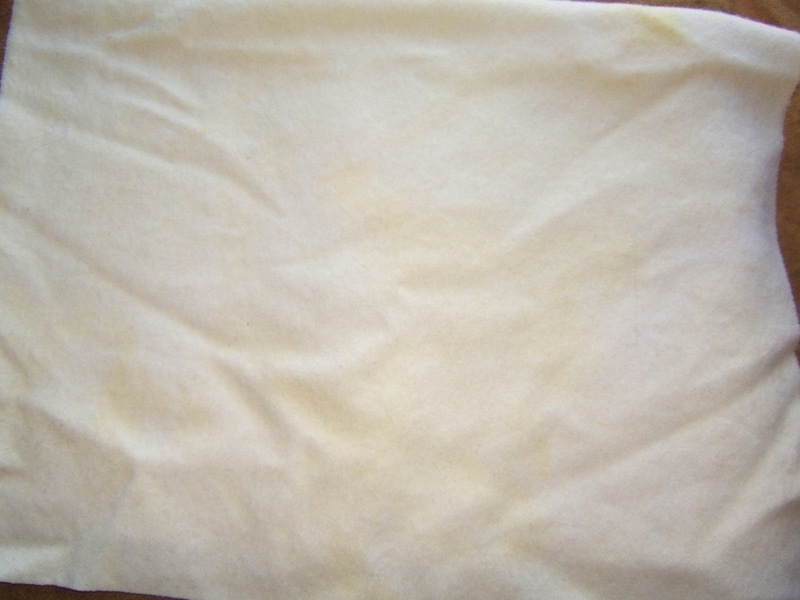 Most of the variations in skin seem to be created with a smudgy grey on the yellow. 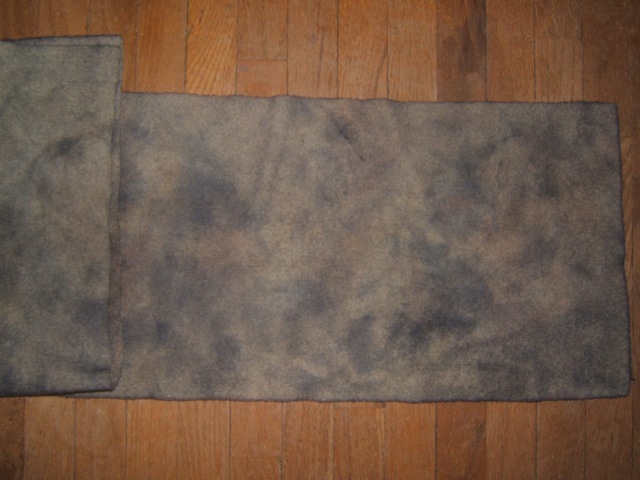 I pondered a variety of ways to try and get the effect….would I use a grey spot dye and over dye it? 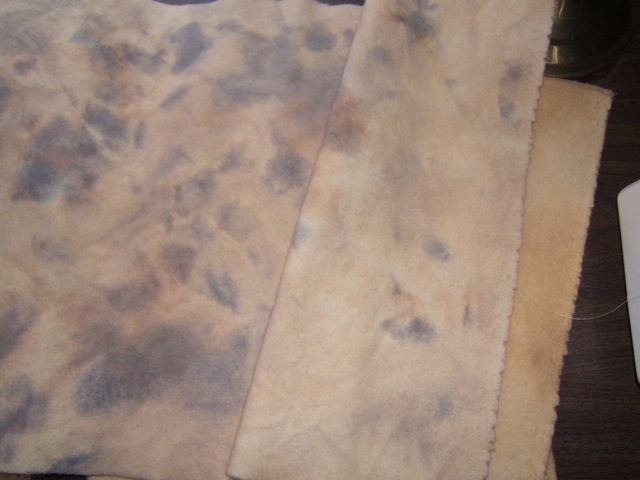 ….I thought of trying it with a casserole dye….what I finally did was.. weakened my basic dye bath so I’d have a paler base, ( 1/32 tsp sand pink, 1/128 tsp mustard in 1 CBW) then made up 1/128 tsp of charcoal grey in 1 CBW. 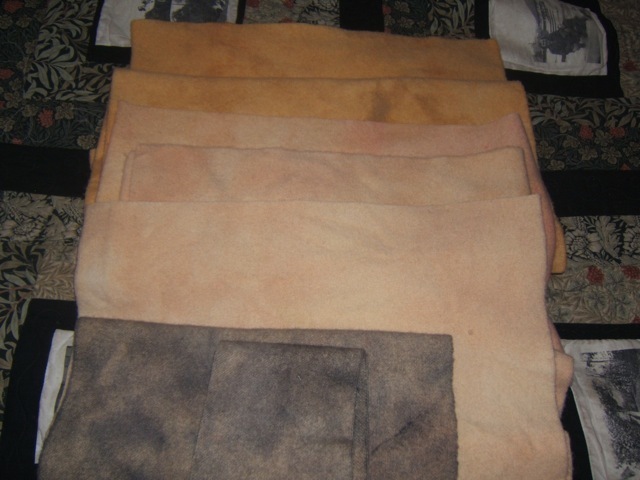 I put 1/2 of the flesh tone dye bath in the pan, added the wool (1/4 yard natural Dorr), then spotted the other half of the flesh tone over it to get some variation. 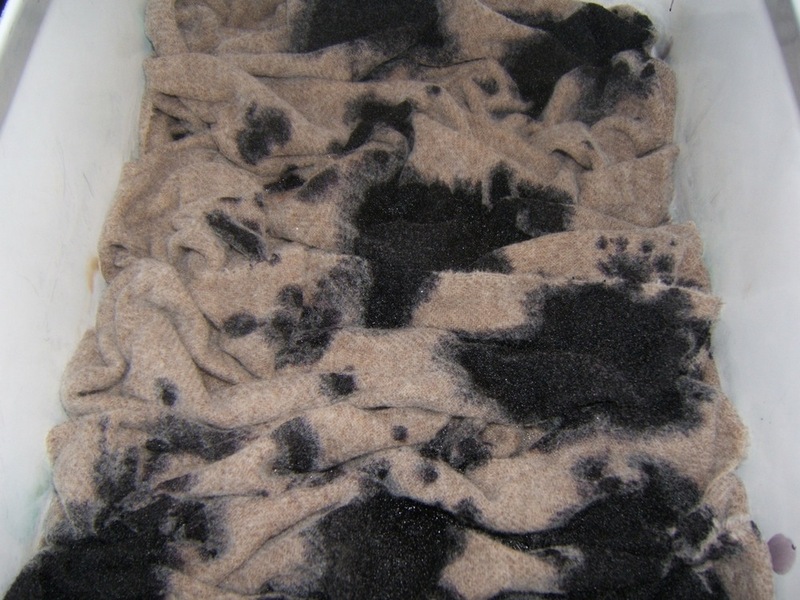 It didn’t take long for the water to clear, and when it did, I spooned about 1/2 cup of the grey dyebath in spots over the wool. Now my fingers are crossed! 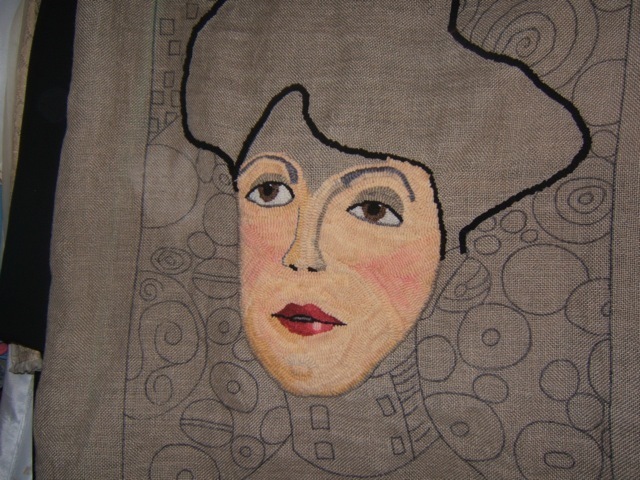 The skin tone of the painting is very yellow….so I used pink sand and mustard dyes to create the flesh. I’ll need a blush colour over the base for the cheeks. If the grey works, I’ll do the cheek colour the same way. 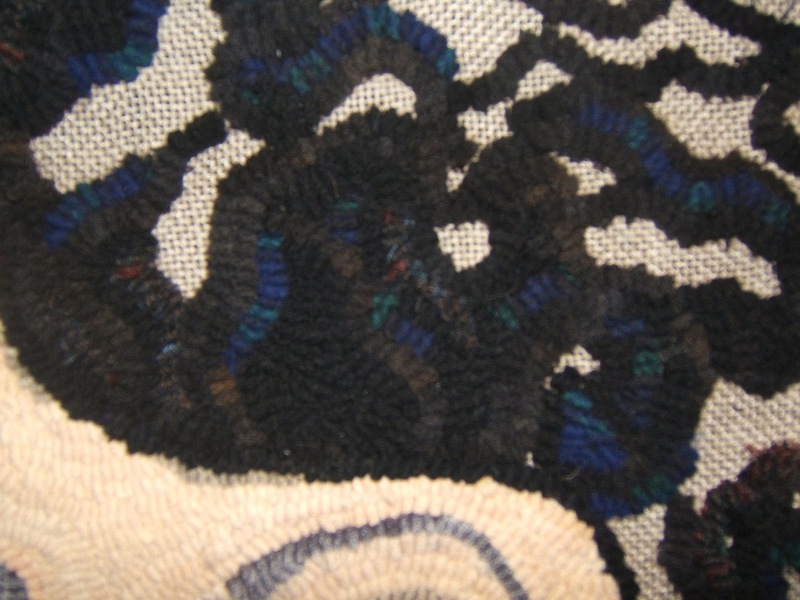 This has got to be one of the ugliest pieces of wool I’ve ever created…but I think it will work for what’s needed….lets see!